In Scenery Forge we have developed a very simple technique to harden and prolong the life of your plaster buildings by applying polyurethane resin on them once they are mounted and dry. 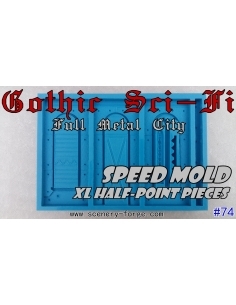 This pack contains ALL the molds available in this Gothic Sci-fi setting. In this case, we have a very efficient mold since the resulting parts are ready to be assembled. It provides us with 4 structural pieces of 5,2cm x 8cm, columns, balconies, decorations and doors. This mold is an ideal complement to the master mold 62 because it gives us a very considerable speed when finishing our game tables. You have a mold in front that will provide you with an enormous amount of combinations. Its combinable pieces allow us to make buildings of different heights and with much decoration such as columns, balconies, banners and coats of arms. It is a very large mold full of possibilities! Very useful for medieval environments and fantasy but also in historical settings and sci-fi. It is also ideal for creating Dungeons and hosting role games. The design is designed to recreate ostentatious buildings of a medieval appearance or ruins of ancient buildings, the final look will depend on you! 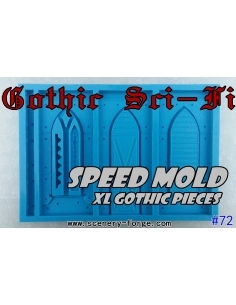 This mold provides pieces of the same size in width to the Gothic pieces of the mold # 61 that many of you already have. 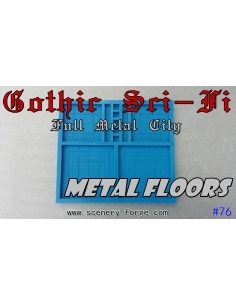 This mold provides us with pieces to create floors compatible in size and aesthetics with the Gothic Sci-Fi system. With this mold you can make a multitude of multicomponent elves. Use polyurethane resin or modeling putty. Try to eliminate visible bubbles with an unsharpened instrument when you reproduce your miniatures with resin. This mold contains: Window base x1, Window upper part with Gothic arch x1, Window upper part with Romanesque arch x1, Parts for raising windows x2, Gate arch x2, Large arch connection piecex1, Large closing columns x1 , closing column for balconies x1, balcony x1, column half circle x1, column quarter circle x1, shutter of Gothic shape x1, shutter Romanesque x1, pieces of blind x3, decoration for windows x4, buttress x2, decorative embrasures x1 , large door x1, small door x1, column base x2, skull decoration x1, balcony decoration, x1, pieces to create floors x3. Welcome to the fortieth millennium! This mold is inspired by one of my favorite fantasy universes and also of many of you. I have given it a metal look worn by the passage of time, with many rivets. This mold allows us to make buildings as high as we want, creating truly epic buildings! This mold contains: structural pieces x7, closing column x1, pneumatic wheel x1, train wheel x1, controls / decoration x2. 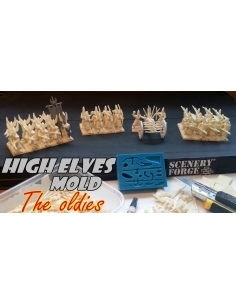 Although at first glance this mold seems abstract, it is one of the most versatile and fun! This mold contains: Gothic closed door x1, Gothic open window x1, Gothic closed window x1. This mold is the perfect complement to mold # 72 and master mold # 71 because it contains door and windows compatible in size and shape with these molds. Designed so you can decorate the interior of buildings quickly. You can also be part of different projects not related to the rest of the molds. ATTENTION: These pieces are very thin therefore they are difficult to unmold without breaking them. You can use a harder plaster or resin. If you use a less hard plaster, wait until it is too dry to unmold it and do it carefully!